'Arrival' has 'arrived' on iTunes and soon will be available on Napster, Tradebit, PayPlay, Pocketgroup and MusicIsHere to name but a few. Tracks 11 and 12 are both arrangements of Traditional Irish pieces. They have particularly beautiful melodies, which may be familiar, and which work effectively on two guitars. Both these arrangements are by Peter Wiltschinsky. Traditional Irish music initially became popular in the 17th century with composers such as Turlough Carolan, Thomas Moore and John Field. Carolan (1670-1738) was a harp player, and a prolific writer, composing more than 200 compositions in a baroque,Vivaldian style. These composers, of the early Romantic era, have been credited with the creation of the nocturne form, later to be developed by Frederic Chopin. Irish music continues to be hugely popular and influences many other genres. Lennon and McCartney's song 'Eleanor Rigby', track 9 on 'Arrival', requires little introduction. This arrangement was made by Peter Wiltschinsky and has always been very popular in concert, often being played as an encore. Track 10 is by Fernando Carulli, 'Nocturne de Salon Op.227:I.Allegro II.Largo III.Allegretto'. Fernando Carulli, also sometimes referred to as Ferdinando Carulli, was born in Naples in 1770, and was to become one of the most popular classical guitar composers and players of his time. Carulli initially started playing the cello, but at the age of 20 discovered the guitar, and fell in love with the instrument. 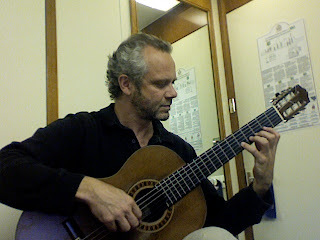 At that time there were no guitar teachers in his native Naples, so he taught himself, developing his own style of playing, which later enabled him to write an excellent tutor book. By the age of 38 he moved to Paris, where he lived for the rest of his life, composing more than 400 works. To learn more about Carulli you can visit here. I must be a romantic at heart as this is one of my favourite pieces. Felix Mendelssohn (1809-1847) composed 8 cycles of 'Lieder ohne Worte' (Songs Without Words) from 1830 onwards. This one was written in 1843 and features a lyrical, predominant quaver rhythm on top of a rhythm triplet accompaniment, which creates an effective cross-rhythm. Mendelssohn's 'Songs Without Words' remain his most famous solo piano compositions, and this piece was arranged for two guitars by Miguel Llobet. Mendelssohn was born into a wealthy and notable Jewish family, and was the grandson of the philosopher Moses Mendelssohn. Felix's sister, Fanny, was also an accomplished pianist and composer but was not encouraged to pursue music as a career as it was not considered a proper occupation for a woman at this time. She did however have six of her early songs published under Felix's name. To read about the life of Felix Mendelssohn you can read more here, or, here. I always enjoy the emotional charge inherent in this music and hope that other listeners are equally entranced. So enjoy Felix Mendelssohn's 'Song Without Words No.1,Op.62'. Track 7 on 'Arrival' is 'Invention No.8,(BWV 779)' by J.S.Bach. "Light, airy, fast, it nourishes as it dazzles - perfection in 45 seconds." Track 6 on 'Arrival' is 'Tarantelle' by Pierre Petit. Every time I hear this piece I can't help laughing, but you will have to read on, to the end, to find out why. 'Tarantelle' along with 'Toccatta' are, in Robin's opinion, two of the greatest duo pieces written, and are certainly amongst the most difficult to play. Pierre Petit studied at the Paris Conservatoire, and in the 1950's was made director of light music for the French radio and T.V. company ORTF. He was also a music critic for 'Parisien Libere' and 'Le Figaro'. His compositions include the 'Suite for Four Cellos' (1945), 'Zadig' (a ballet, 1948), 'Concerto for Piano and Orchestra' (1956), and a 'Concerto for two Guitars and Orchestra' (1965), which was composed for the famous husband and wife duo, Ida Presti and Alexandre Lagoya. In 1946 Petit won the much coveted composers' competition, the 'Prix de Rome'. The 'Tarantelle' is a piece of music best avoided if you suffer from arachnophobia. It is however also a joyful and ebullient piece of music, which in the first slow section quotes, 'Clair de Lune' by Claude Debussy. As the piece progresses, you can certainly imagine a gyrating person as they suffer the consequences of the tarantula's venom. What you can't hear, unless you purchase the track of course, is the end of the 'Tarantelle'. This is where my amusement arises. The Hill/Wiltschinsky Guitar Duo have frequently performed the 'Tarantelle', and usually, it is programmed at the end of the first half, as it has such a grand finale. Naturally one wants to leave their audience keen to hear more. The Hill/Wiltschinsky Guitar Duo are certainly not known for ever playing safe in live concerts. Instead they constantly push themselves, and each other, to perform the most exciting version they can, whilst obviously maintaining accuracy. A difficult balance to achieve. Fuelled by concert adrenaline, it makes for a heady mix. The 'Tarantelle' is therefore the perfect piece to stimulate the duo's virtuosity. As the piece progresses it becomes more and more exciting, and on one occasion, Robin got rather over enthusiastic. He knew the performance was going well and the audience were already stunned. However, on the finale of the piece Robin executes a rapid drum roll on the side of his guitar, using both hands. Robin was pleased with the fantastic percussive effect until he glanced down at his beautiful Rubio guitar and spotted a massive split in the Brazilian rosewood along the guitar's entire length. During the interval he was able to inspect the damage, but there wasn't really a lot that could be done. The entire second half of the concert was performed with a little more caution. The Rubio was later repaired and restored to it's former glory. Go and have a listen, from the extract that you hear, it starts to become apparent, just how frenzied 'Tarantelle' becomes. Track 5 on 'Arrival' is the beautiful 'Romances Sans Paroles op17, No3, Andante Moderato' by Gabriel Faure. Gabriel Faure (1845-1924) was a French composer, teacher, pianist and organist, who developed a personal style that had considerable influence on many early twentieth century composers. He was the youngest of six children and as a child often played the harmonium in the chapel of his school. It was here that an elderly blind lady overheard him playing and informed his father of his gift for music. It was from this point that Faure later attended the 'Ecole Niedermeyer' where he remained for 11 years, studying mainly church music. It was only after Niedermeyer's death, that Saint-Saens was appointed, and Faure studied piano and was introduced to contemporary music, not on the school syllabus, such as Schumann, Liszt and Wagner. After leaving school Faure was appointed as an organist, gave lessons and started composing. Apart from a period when he enlisted during the Franco-Prussion war, the majority of his time was spent within various posts as an organist. After marrying in 1883, to support his wife and two sons, he gave piano and harmony lessons, and to supplement his income sold his compositions to publishers, with full copyright, for 50 francs. It wasn't until the 1890's that he began to realise some of his ambitions and he was over 50 before he started to become well-known. In one teaching position around 1897, his pupils included Ravel and Enescu, but it was in 1905, when he became director of the Paris Conservatoire, that his fame spread. This was partially due to undertaking some controversial reforms, but resulted in his works being performed at important concerts and venues. Although he continued to compose throughout this period it wasn't until retiring in 1920 that Faure could at last devote all his time to composition. But despite his failing health, his interest in young musicians continued, and he helped many, including Arthur Honegger. Faure's harmonic and melodic innovations influenced the teaching of harmony for later generations. Together with the Romances for voice and piano, the three Romances Sans Paroles are his earliest surviving works. The lyrical qualities of his music make it an ideal vehicle for the more reflective and poetic aspects of the guitars. As you can hear with 'Romances sans Paroles op17 No3 Andante Moderato'. As a footnote, Faure is frequently referred to here at Hillhouse, but in a very different context. Whenever Robin goes out on a shopping trip, he announces his intention by saying, "I'm going on a Gabriel", strangely, I always seem to know what he means. Track 4 on 'Arrival' was composed by the Italian Mario Gangi. 'Suite Spagnola' was composed in 1948 and is in three movements. This is a fantastic piece of music which I have heard performed by Hill/Wiltschinsky many times. The opening, with it's precision playing by both performers, is perfectly synchronised and always impresses. As the piece develops it's flamenco roots become ever more apparent and it becomes increasingly difficult to keep one's feet still! In this recording Robin made slight adjustments to the original score to ensure both players had equally important roles, he also duplicated certain passages in octaves to strengthen the impact. After hearing this recording of Hill/Wiltschinsky playing 'Suite Spagnola' Mario Gangi was inspired to compose one of his best known works for guitar duo, with Hill/Wiltschinsky as the dedicatees, the 'Suite Italiana'. You can read more about that here. However, only the first part of the first movement of 'Suite Spagnola' can be heard, unless of course you buy it! A few years ago I was lucky enough to meet Maestro Gangi, whilst in Bari, Italy, with the Hill/Wiltschinsky Duo. We spent a very pleasant evening together and he took great delight in teaching me how to eat spaghetti like an Italian! So have a listen to 'Suite Spagnola' and enjoy. The third track on 'Arrival' is 'Musette' by Jean Absil. A musette is a dance-like piece of music, pastoral in nature, whose style is suggestive of the musette, or bag-pipe. In this context though, the musette isn't actually a bag-pipe (you may, or, may not be pleased to hear) but is referring to the pedal tone in the bass line, which continues throughout the outer sections of the piece. The haunting and meandering melody intones above this fairly static and hypnotic accompaniment. Jean Absil (1893-1974) was a Belgian composer who studied the organ, piano and harmony. Although Absil did initially perform on the organ, he decided to concentrate on composition, winning the Agniez Prize in 1921 for his First Symphony, and in 1922, his cantata 'La guerre' took the second Belgiun Prix de Rome. For many years Absil taught in various conservatories, but it was not until 1938 that his piano concerto brought him international recognition. Absil was initially greatly influenced by Wagner and Strauss and it was only in his post 1934 works that his more individual style emerged. After 1938 he attempted to make his work more accessible whilst still retaining the folk-like themes. The second track on 'Arrival' is 'La Vecchia Pavane and Galliard', by John Johnson (1540-1595). A Pavane is a Court dance of the 16th and early 17th century, which is usually sedate, and often an introduction for a processional dance. The pavane consists of two single steps and one double step forward, followed by two single steps and one double step backwards. It's played in duple time, 2 or 4 beats to the bar. The Galliard is much livelier, a triple-metre dance, usually with regular phrase structures of 8, 12, or 16 bars, with a step-pattern of five movements taken to six minims, which is similar to that of the salterello, except that the steps are higher and more vigorously executed. As you listen to these pieces, you can easily imagine the ladies and gentlemen of the Elizabethan Court enjoying the music and joining in, starting with the slow Pavane and moving on to the more energetic Galliard. 'La Vecchia' simply means old. At this time it was common for lutenists to undertake the position of an apprentice within a noble house, often from a very early age. This was an essential process for any musician of 'low birth' to make contacts with the wealthy aristocracy, which would then allow them access to the Royal Courts. The modern day equivalent would presumably be blogs, MySpace, Twitter, and the like, the modern way of networking. Whilst records are difficult to trace, it is thought that Johnson would have undertaken an apprentice position in a noble house, likely to be that of the Earl of Leicester. His skill as a lutenist didn't go unnoticed though, and by 1577 he had entered the Royal services of Her Majesty's Musicians for the three lutes, along with Mathias Mason and Thomas Cardell. The number rising to six or seven lutenists as the popularity of the instrument increased. John Johnson is regarded as the founder of the school of English lute music of the 'Golden Age', which culminated in the works of John Dowland. Johnson's playing must have been exceptional, and it is believed that he was Queen Elizabeth I favourite lutenist, but his importance also lies within the huge body of works available today. His manuscripts have been found all over Europe even though it's thought that Johnson never left England, a feat only matched, and exceeded, by John Dowland himself. The musical tradition continued with his son, Robert Johnson (1582-1633), also a lutenist, but he was connected with Elizabethan Acting Troupes, working with playwrights such as William Shakespeare, Beaumont and Fletcher. So, 'La Vecchia Pavane and Galliard' is steeped in the lute tradition, although Johnson developed the lute duet to an unprecedented level of technical and musical excellence. With complete equality of parts being one of the striking features of Johnson's work. Johnson was certainly more prolific than any of his English contemporaries, and 'La Vecchia Pavane and Galliard' together make a fine example of the conversational style of the Elizabethan lute duet. The guitar repertoire is greatly enriched by the assimilation of the lute's vast body of works, in this recording the guitars are played with capos at the third fret to create a more lute-like sonority. Track one on 'Arrival' is appropriately, 'Arrival of the Queen of Sheba' by George Frideric Handel (1685-1759). Handel was a German-born Baroque composer famous for his operas, oratorios and concerti grossi. He was born in Halle in 1685, the same year as Johann Sebastian Bach and Domenico Scarlatti. Handel showed considerable musical talent, on both harpsichord and pipe organ, from an early age, and had already begun composing by the age of 9. Although born in Germany he spent most of his adult life living in England and made his home permanently in London in 1712. The house that he rented, on Brook Street, has since become a museum, 'Handel House', and is well worth a visit. The house, coincidentally, is next door to one that Jimi Hendrix occupied for some time, thus combining two of Robin's greatest musical influences within a few feet of each other! It was during this period that many of Handel's greatest works were composed, Messiah, Water Music and Music for the Royal Fireworks to name just a few. The Oratorio became the national musical speciality owing mainly to Handel's efforts. The 'Arrival of the Queen of Sheba' comes from the oratorio 'Solomon', which was first performed in London in 1748. Handel's scoring of this piece was originally for two oboes and strings, but the dialogue between the two oboes works effectively on two guitars, as does the remaining string writing. This is one of Robin's first arrangements for two guitars. For those interested in details, at the time of this recording both Robin and Peter Wiltschinsky were playing guitars made by the luthier 'David Rubio'. For now though, go over and have a listen to the 'Arrival of the Queen of Sheba', and as one review said, "Has the Queen of Sheba ever made such an exhilarating arrival?" Before I discuss the music on 'Arrival' I did promise to give you a little insight into its background. This particular story does highlight the challenges that musicians sometimes have to face in order to get their music heard, and, occasionally, the murkier side of the classical music recording industry. Really, this is a re-release as the recording dates from 1983, but, as it is no longer available, we felt that it was important to make use of the modern way of delivering music to the world, and release it on the digital market. The story really starts before the recording was actually made, around 1982/3. A man, whom shall always remain well and truly nameless, in fact I shall call him Mr.X, went to see Hill/Wiltschinsky play at the Hexagon in Reading, UK. He was most enthusiastic after the concert and very keen to sign the duo up for a record label he was in the process of forming. So keen was he, that he booked, and paid for, one of the best recording studios in Manchester, at that time, Pluto Studios. Recording of the album took about a week, which is an incredible feat, especially when you consider that there was very little editing as this was such a cumbersome process then. Mr.X also wanted to manage the duo and he sent a contract to be signed. It was at this point that alarm bells started ringing. It must be remembered that this was to be the duo's first recording, and they were very keen to have it released, but had to balance this against the fear of financial exploitation. They decided the contract was unsound, and Robin arranged, and met Mr.X. for a showdown in a local hotel, and explained that he wasn't happy to sign the contract. The irate reaction was, "I'm gonna sit on this goddam album and it will never see the light of day." This was obviously not a good position to be in. The duo needed this album releasing and were rightfully proud of it. Also, it should be remembered that at this time it wasn't as easy as it is today to record and promote music. The backing of a record company was a great achievement. Fortunately, Robin, whilst angry, frustrated, and shocked, managed to keep his cool. He left the hotel and immediately drove to the recording studio, unsure whether the master tapes were still there, or, whether they had already been collected by Mr.X. Luckily, they were still there, so Robin paid for them and removed them from the premises, all carried out whilst thinking that X could arrive at any moment, and cause a great deal of trouble. He didn't and Robin made his escape with the precious master recording. Mr.X did go to the studio the next day to collect the masters, and was utterly furious to find them already gone. He did threaten legal action, which we later found out was quite ironic. It was discovered that he had spent time in jail in the UK, and was being urgently sought by the Canadian police for fraud. True to their reputation they got their man, arrested him, returned him to Canada, and imposed another lengthy jail sentence. So, the duo found themselves in the position of having a finished recording, and no label to put it on. It was taken to London and had very favourable responses from a number of companies, and it was decided to sign to 'Hyperion' for a 10 year period, and was eventually released in 35 countries, on both vinyl and cassette, as 'Virtuoso Music for Two Guitars'. After a traumatic start this album proved to be a turning point for the duo, who went on to record many more times, with various, high profile, labels. All the stresses that Robin went through to ensure this album wasn't destroyed were certainly worth it. In fact, he was in Tower Records, New York City, in 1986, and it was the only guitar duo recording that they had, which was a very proud moment. As this recording has now been unavailable for a few years, and had such an impact on the classical guitar world at the time, we felt it needed to be heard once more. Well, after that sort of start in life, wouldn't you want a new beginning? "Nothing is more beautiful than a guitar - save perhaps two." Here are the sleeve notes to the CD we have just released, 'Arrival'. 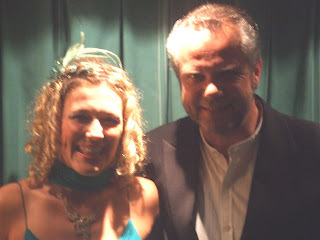 "The brilliance of Ida Presti and Alexandre Lagoya set standards of duo guitar playing that have seldom been equalled. The form is a difficult one. Accuracy and precision are of course prime essentials, but the best duos are welded together by something more: a unity of purpose a spirit of excitement and even adventure, an ability not only to play as one instrument but also to think as one musician. Robin Hill and Peter Wiltschinsky, on the evidence of this recording, have that rare capacity. Their performances are alive, zestful, invigorating. It will make new friends for their exuberant playing, and new friends too for the guitar duo form in which so much can be accomplished. Some of the pieces are familiar; some not so familiar, though they deserve to be. All are hugely enjoyable. Hill and Wiltschinsky demonstrate their very wide range by adapting their style successfully to every new requirement, from the English lute tradition of John Johnson to the 20th century composer, Pierre Petit. The Bach invention could scarcely be better chosen; light, airy, fast, it nourishes as it dazzles - perfection in 45 seconds. And has the Queen of Sheba ever made such an exhilarating arrival? It gives me much pleasure to introduce this remarkable record - as much pleasure as I think it will give to those who listen to it." Follow this link, or click on the picture in the side bar, to have a listen. Next week I shall tell you a little about each piece of music, and also, the strange, and at times rather intriguing, history of this particular recording. Apparently there were great celebrations yesterday as the QE2 left Fort Lauderdale, as it will be the last time she leaves the port, before retiring. As yet, I don't have any further news or pictures, but I will add some if, and when, they arrive. Today she is cruising the Atlantic, on her way to New York, and tonight is Robin's third, and final concert, before he makes the long journey home. Whilst he prepares for that, I have been busy here. I have just had news that the latest CD to be released, 'Arrival', will be ready in the next few days. So there will be more on that, probably next week. Today though, I have many things to do in preparation for this event, so I will direct you to Izzy Cooper's blog, where you can read all about her impressions of performing Rodrigo's Adagio with Robin the other night. 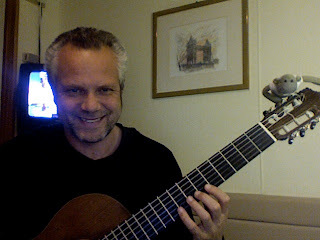 The QE2 was cruising the Straits of Florida yesterday, and Robin spent the day rehearsing for his second guitar concert. The news is good, and I've had reports from various sources, that the concert was a great success. There was a minor hiccup about 2/3 of the way through, when Robin's silk nail wrap became unstuck. For any guitarists out there, they will realise that this is a problem, and one that has to be dealt with before play can continue. For the non-guitarists amongst you, Robin uses silk wrap on any damaged areas of nails of his right hand. Classical guitarists require long, and strong, nails to produce the correct sound. When performing as frequently as Robin does it is inevitable that nail damage will occur. The problem is how to repair that damage without losing any sound quality. Over the years Robin has tried many things and his current method is to use a special silk wrap and glue. Consequently, as the wrap became unstuck, he had to leave the stage for a few minutes, and do an emergency repair. This happens occasionally, and whilst rather stressful for Robin, the audience don't seem to mind, especially as he always explains what has happened, and occasionally actually carries out the repair on stage as he introduces the next piece of music. He went on to perform the Mozart variations, which if you recall had been requested on this particular trip. It must have gone well, as some of the audience showed their appreciation by standing, along with some of the resident musicians. After the concert he spoke to a few members of the audience and was delighted with their comments. 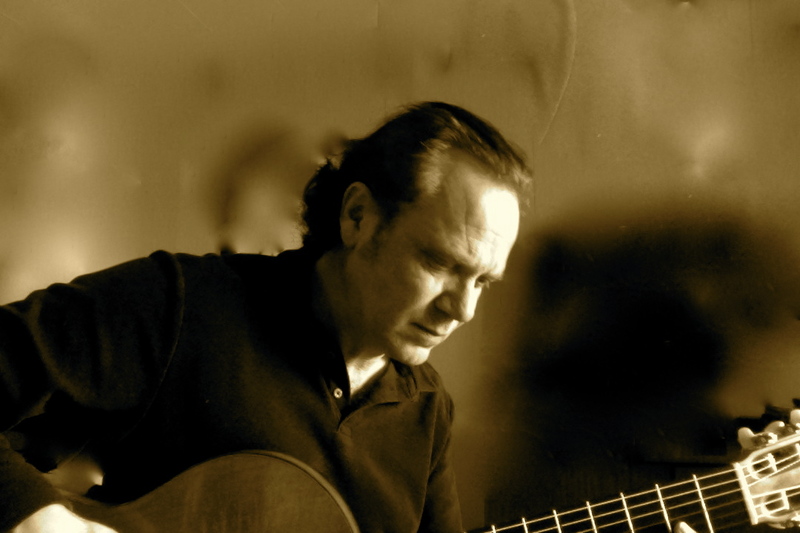 Particularly the compliments paid by two Spanish men, who are friends with the incredible guitarist, Paco de Lucia. Meanwhile, back in the UK, I was surprised yesterday by a large increase in the number of hits to the blog. Sometimes you can work out why, sometimes not. The trend seems to have continued so far today which is nice. One of the reasons could be a report by the BBC, about an appeal to identify a body found in 2006 on Islay. I know that's rather gruesome, and you may be wondering why I have made this connection. Well, it's because Robin composed a piece called, 'Return to Islay', featured on 'Virtuoso', and as people have been searching this story, they have come across a rather more uplifting side to the beautiful Island of Islay. I have a selection of updates for you today. First, it appears that the Captain on the QE2 has a sense of humour. Read this post from a few days ago. Well, it appears that a number of April Fool pranks were going on, all over the ship, for most of the morning. The giant cat, advertised in the daily newspaper, had many guests up on deck hoping to catch a glimpse of this beast. Whether a crew member was parading around with a stuffed cat, I'm not sure, but, there wasn't actually an Egyptian man with an enormous cat in residence. However, some guests may have missed it. Particularly if they don't have good sea legs. In each room is a TV monitor, which you can have tuned to a camera, that's situated on the front of the ship. Then you can watch the sea, from a similar perspective to the captain, and follow the ships progress. On the first of April, the live shot was replaced with some video footage, of extremely rough sea, crashing over the QE2. Robin said he turned the monitor on, saw the huge waves, and was somewhat surprised. After many trips around the world, some of them in very bad weather, with waves of over 40 feet, he knows what rough sea feels like. On this day though, the ship was steady as a rock, no cupboard doors banging, no pitching and rolling, no music falling off stands. He went to investigate and discovered a beautifully calm sea outside. Secondly, it seems that Robin and Izzy's performance of Rodrigo's Adagio is still being appreciated by the audience. Izzy has now left the QE2, but Robin has a few more days, and two concerts to perform. He decided to venture into the restaurant for some coffee, only to be met by spontaneous applause from a group of guests. It's very nice to be appreciated. Finally, I decided to have a quick look at my husband on YouTube, just to remind myself what he looks like, and clicked on the 'Virtuoso' link. I haven't been there for a while and there were a couple of new comments, one of which intrigued me. Someone claims to have met Robin in the 70's, as Robin went out with his sister for a while. He remembers him well because of the many hours of practice he did! I finally got news of the performance the other night of Rodrigo's Adagio, with the soprano Izzy Cooper, and by all accounts it went very well. Here are the artists after the concert, a slightly blurred image, but there were many photos being taken at the time, and much autograph writing, which is always a good sign! I'm sure they will work together again as the performance was so well received. It was just one extra piece for Robin, albeit and eventful one, and his second 'official' concert is actually tomorrow. Today though, the QE2 is due to spend a few hours in Montego Bay, Jamaica. Robin Hill and Izzy Cooper to Perform Rodrigo's 'Adagio'. The QE2 spent a long time getting through the Panama Canal yesterday, as there appeared to be a lot of traffic. Consequently, they didn't stop for a few hours in Cristobal, Panama, but continued on their way. I did have a message from Robin that he was due in Cartagena, Columbia, later today, and that he was rather confused as he knew he'd been there before, and only a few weeks ago, but couldn't remember anything about it. I couldn't either, so I searched the blog, and realised why we couldn't recall Cartagena, when I read this post. He never went into town. He may not this time either, although we'll have to wait and see. The soprano singer, Izzy Cooper, has asked Robin perform one piece tonight in her concert. They have met a few times before, and always got on very well, so he has agreed to play. Cartagena may have to wait yet again. It's more than likely that rehearsals will be taking place. The piece they are performing is Rodrigo's 'Adagio', the song version, which was arranged by Rodrigo himself. Basically the voice replaces the Cor anglais and the guitar plays the original part. I must say, I'm sure it will be beautiful, and I wish I could be there to hear it. The concert last night went very well, and Robin has been receiving very nice comments all day for members of the audience, from as far afield as Perth, Australia, and Huddersfield, England. It makes all those hours of practice worth it. If you are on board the QE2, and have been waiting for the Mozart Variations, then I believe they are in the next concert, so you will have to wait a few more days. There is a rumour, that Robin has been asked by another artist, to perform one piece in her concert. I'll confirm this, as and when, it has been finalized. I'm not sure if it's the third or fourth time that Robin as been there this year, but never the less, I'm sure he will be enjoying it. Sometimes you are issued with a certificate to prove you have been. I'll have to start thinking of redecorating with them, if he continues to return so frequently. I'm sure he'll be allowing himself a little time to relax today though, and will probably do some crocodile spotting up on deck. The QE2, the Giant Cat, and Plenty of Practice. I can only assume that guests are transferred to shore in order to visit, and that she hasn't left port leaving Robin on land, as I have since had messages from him. What a beautiful setting though. It's another day at sea, which for Robin is good, as there will be no distractions for him, as his first guitar concert is tonight. Luckily his neighbour, a German guest, is still enjoying all this music. He may not feel the need to actually go to the concert though, as from experience, I know that Robin will run through the entire programme, at least twice, and probably more, over the course of the day. But I hope he does attend, as it is always very different when you see pieces performed in public, with the atmosphere of a concert, and all the introductions. Robin did take a little time out to sit in the sun and listen to Cecilia Bartoli and some Respighi. He also informs me that the worlds largest cat is on board. I know there are a lot of cat lovers out there, and many are fellow bloggers, so I have asked for a photo, as soon as possible. Robin spent yesterday in Acapulco, Mexico. As his first concert isn't until Friday, he allowed himself some time on land, and went to visit a few familiar places. He was, after all, only there a few weeks ago, and likes it very much. But Robin doesn't always seek out the tourist sights. His obsession with the guitar is all consuming. 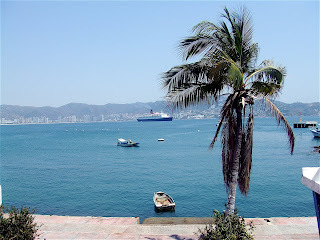 This is one place he found in one of the back streets of Acapulco. 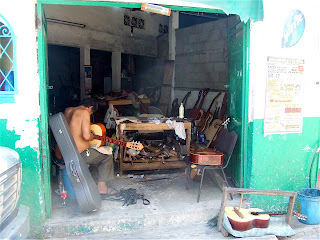 These guitars may not be like his Miguel Rodriguez 'Churchdoor', but it's a great photo, and a scene you are unlikely to come across in any street in the UK! 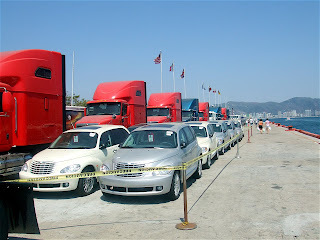 If cars are more your thing, then the Mexicans seem particularly keen on PT Cruisers. Robin is now back out at sea and will be cruising the Pacific for the next two days, on the QE2. So that should give him plenty of time to prepare for his concert. Meanwhile I am recovering from the early start that the new school term brings. I'm about to make another cup of coffee to ease my way into the day, and any guilt of drinking this stimulant, has been dispelled by this recent report. People often ask me how much guitar practise Robin does. The answer is a lot, a point highlighted by the comments of a passenger on board the QE2, who happens to have the room next door. "I went out on deck, came back, and still you were practising, I went for lunch, came back, and still you were practising, went to a lecture, came back, and still you were practising." Luckily for Robin, this gentleman didn't mind, he was just incredulous that someone could keep up this level of commitment, for the last four days. Being heard whilst practising is an issue when away, and Robin does often go off, and find an isolated spot somewhere. He's even been known to put a sock underneath his strings to dampen the sound. But, in order to give the performance that is expected of you, practise you must. Good job Robin enjoys it. However, he did take time out to go for lunch with Francisco, a Paraguayan harpist, who he has met a few times before. The conversation, as often does with musicians, turned to strings. We seem to have inadvertently found yet another use for the thousands of guitar strings that we have around the house. He has now discovered that Paraguayan harpists use guitar strings for their treble register. We have hundreds of them, so, it has been arranged that we will send some onto Francisco. So the next time you hear, 'Guantanemera', played on a Paraguayan harp, some of those strings may well have previously been on Robin's Miguel Rodriguez guitar, and played just one concert, somewhere in the world! Robin has settled in on board the QE2, and is currently cruising the Pacific. He has met up with a few familiar faces amongst the staff and crew, with one member being particularly pleased to see him, as he loves the guitar. When having a break from his duties, he can often be found sitting in on Robin's rehearsals. They've become quite good friends over a number of trips. I also know that a number of guests on board have seen Robin in concert before, and are looking forward to the forthcoming series. I know this because they got in touch with me before he left, and requested the Mozart Variations! I passed the message on, and Robin has agreed to perform them, so hopefully they will be enjoyed by all. The first concert isn't until Friday, but I have been sent photographic evidence that guitar practice and rehearsals are already well under way. However, there appears to be a stowaway on board. Son number two requested that his 'friend' went along, and his antics so far have been causing quite some mirth here at home.